Airzone HVAC Services carries a complete line of furnaces from the top three manufacturers in Ottawa; Amana, American Standard, and Lennox. Having had the choice of almost any supplier in the industry, we have chosen these three because we believe that they represent the best quality, efficiency, and value for our clients. Choosing the correct furnace for your home can be a challenge with all of the products available. We would be happy to provide you with expert advice on which system would work best in your home through our FREE home consultation program. Our team of certified high efficiency furnace experts are highly trained to properly size your furnace and provide more information about the furnace products available to you. HAS YOUR FURNACE BEEN RED TAGGED? WE OFFER A FREE SECOND OPINION! With the recent addition of American Standard to our furnace manufacturer lineup AirZone HVAC Services is now able to offer consumers in Ottawa and the Ottawa Valley an extensive line of furnace products to meet almost any heating need. One furnace in particular has consistently stood out from the crowd and is currently our most purchased Ottawa heater. This product is the American Standard S9V2 High Efficiency Variable Speed Furnace. Let us start by saying this is one good looking product! Maybe it’s because we are in the industry, but we find that this furnace is a heater that you will want to show off to your friends! Two UV shields are placed on the unit. One provides a view of the burner, and one shows the self diagnostic screen. This Ottawa furnace product really stands out from the crowd! Of course looks aren’t everything… It’s what is inside that really counts. American Standard is one of the top brands when it comes to reliability and performance. One of the most popular features of the S9V2 is it’s best in class air production per watt. The benefit here is that hard to heat rooms in your home will be more equalized due to the Panasonic Vortex motor. This means less temperature compensation (rooms are too hot to make far away rooms comfortable) and much greater efficiency. Another highlight of the S9V2 furnace is the heaters ability to provide constant comfort. This Ottawa furnace offers a comfort range of only 1 degree. This is compared to 2.5 degrees with our AMEC furnace product. Imagine less temperature fluctuations and consistent heating… This almost always leads to a better nights rest without having to put the blankets on and off as the furnace operates. If you are looking for a furnace with best in class blower, dazzling appearance, constant comfort, and don’t want to blow the budget on the top of the line SLP98V, this is the furnace for you! It’s why it is our most popular Ottawa heater right now. Interested in the Most Efficient Furnace? If you want the most efficient furnace, you are looking for a modulating variable speed furnace. A reduced noise level due to the motor running at a lower speed. Better air circulation in your home – including during the summer when paired with an air conditioner or heat pump. A reduction in utility costs. An improvement in indoor air quality. Remote diagnostics when paired with a communicating thermostat. Our furnace installation services is the best in the business! We use highly qualified employees for our installations to ensure quality. Our annual maintenance programs help you to save money every month on your utility bills, maintain your furnace warranty, and help to avoid the inconvenience of a breakdown. Our furnace diagnostic and repair service allows you to get a second opinion and does not lock you into a repair. Our trucks are stocked with the most common repair parts for all brands of furnaces installed in the greater Ottawa area. This allows for a faster repair service. Our furnace protection packages provide easy low monthly installments and scheduled service so you never miss a furnace maintenance. They also help you to save money through discounted services! 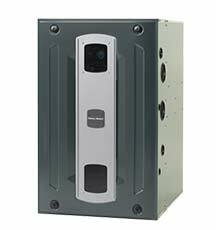 Our most popular entry level Ottawa furnace right now is the high efficiency Amana AMEC96 furnace. 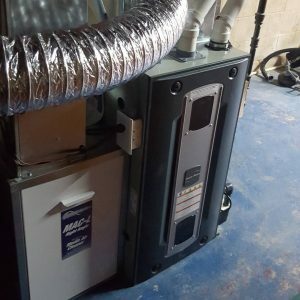 There is a long list of reasons that this furnace has been flying off of our shelves in Ottawa and the Valley, and we have included some of the highlighted benefits below. Two Stage Gas Valve: This furnace is capable of operating in three different states (Off, Low Speed, and High Speed). 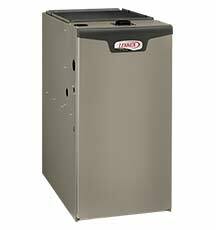 By utilizing the lower speed this furnace delivers exceptional high efficiency operation and a significant improvement in indoor air comfort when compared to a single stage product. The furnace typically operates at the low speed when the higher speed is not needed. The high speed is able to deliver powerful heating during the coldest of days. Quiet Operation: This furnace has special sound dampening insulation resulting in a quieter operation. A heavy gauge steel shell and sound isolated blower assembly help to lower the operating noise of this heater. This is further reduced when operating in low mode. Enjoy great performance at a great price without being bothered by all the noise that a non-insulated furnace will create. Rebate Qualification: An important consideration when choosing a furnace is to take advantage of any rebates available. Due to it’s high efficiency rating, this AMEC96V Amana furnace qualifies for the IESO 250 rebate. Amana Quality at a GREAT Price: Amana is a very well know manufacturer of high efficiency furnace products and is very popular in Ottawa and the Valley. 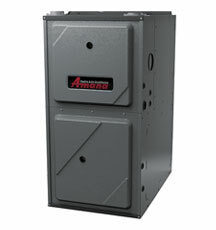 In fact, many HVAC experts consider Amana to produce the best value of furnace when considering performance and price. Amana offers a great entry level product that is perfect for first time homebuyers, rental units, and consumers looking to purchase a great furnace at a great low price. To learn more about this furnace please download the brochure by using the following link: Amana AMEC96 Furnace Brochure. 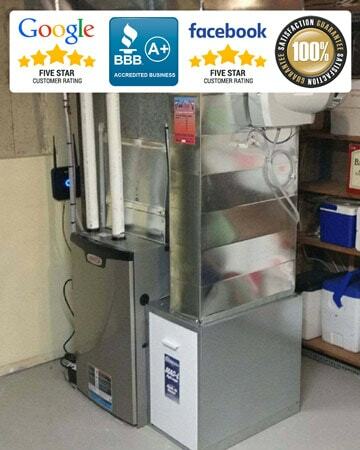 Our clients in Ottawa and the Valley love this furnace due to it’s perfect balance of efficiency, price, and quality. Did you know that you may receive a discount if you are considering a combo purchase? There are many benefits to having your furnace and air conditioner installation completed at the same time! Ask us about how you can save by having a new furnace and air conditioner installed at the same time. This type of combo installation is ideal because it offers the least inconvenience for the homeowner. You will also receive the benefit of having new heating and cooling equipment installed that works together a part of an optimized system. This results in the most energy saving benefits alongside an increase in home comfort and precision temperate control. We take our role as a leader in furnace installations very seriously. Our company was built with a customer first approach. In order to exceed our client’s expectations, we provide ongoing in house furnace installation training to our installers in addition to their certifications. We also maintain our high standards by following installation checklists to ensure that every detail is taken care of in a professional manner. Our furnace installers are expected to leave your home as clean as it was (or cleaner) before they arrive with as small an inconvenience as possible for the homeowner and residents. We have an A+ rating from the Better Business Bureau along with a large history of positive reviews on Homestars, Google Places and Facebook. We encourage our customers to search our name to view recent reviews about our company. We are proud of our high quality furnace installation history and our dedication to customer service! Did you know that AirZone has a very large coverage area? We supply, install, repair, and maintain furnaces across the greater Ottawa area including the Ottawa Valley all the way up to Deep River. Our most popular installation areas include Kanata, Nepean, Orleans, Gloucester, Barrhaven, Pembroke, and Petawawa. By offering such a large coverage area we keep a large fleet of vehicles in different locations to ensure speedy service. Annual Fuel Utilization Efficiency is a rating that allows to to understand how efficient a furnace is performing in terms of efficiency. Consider every 1 dollar you spend on heating your home. A furnace with an AFUE rating of 96% would provide 96 cents of usable heat out of the dollar spent. This is an easy way to analyze and compare furnaces with different efficiency ratings. We recommend furnaces that have at least a 96% AFUE ratings since these products often qualify for additional government rebates (versus lower efficiency models). Ductwork is often forgotten when considering a home heating system. Your furnace supplies air throughout your home via a series of ducts. If these ducts are leaking you may be spilling air into the wrong spots in your home. A common problem indicator is when rooms that are further away are much colder than rooms close to the furnace. Also, a poorly designed duct system may restrict airflow resulting in poor heating equality. This usually leads to a homeowner turning up their furnace to compensate for the colder rooms. This reduces your home efficiency and makes certain rooms less comfortable. A new furnace will not fix ductwork issues. Instead, make sure to analyze your ducting system when considering your home’s efficiency and comfort. Products such as fan boosters can help to equalize heating in your home, and duct sealing is always a good option to improve efficiency and duct performance. Due to our broad coverage area across Eastern Ontario, we deal with a lot of oil furnaces. Furnaces that use oil as a fuel are becoming less and less common due to their operational cost. For customers outside of the city, propane is a much more affordable alternative. In order to make the switch from oil to propane a conversion must be completed. Once done, your will see a very large reduction in fuel costs. Oil to propane conversions is one of our most popular services across the Ottawa Valley. For clients living in the Ottawa area, natural gas is the best choice for a high efficiency furnace. The availability of natural gas in your area usually decides whether you will have a natural gas or propane furnace installed in your home. The first thing you should do when considering a new furnace for your home is have your equipment sized correctly. British Thermal Units (BTU) provide a measurement of the amount of heat generated from your furnace (output). Residential furnaces are available from 40,000 BTU all the way up to 120,000 BTU. This is one of the most important reasons to choose an expert heating company who will size your system correctly. A under-powered furnace will result in rooms that are warmer and colder throughout the home. Further, a furnace that is not pushing enough warm air has to work that much harder. This will result in a furnace with a reduced lifespan along with higher utility costs. By having your furnace properly sized, it will perform as it should providing much more consistent heating throughout your home. AirZone has extensive experience with properly sizing residential furnaces across Ottawa and the Valley. Contact us today for a free estimate on a new furnace even if you are just looking for a second opinion. A common question we receive from our customers is when they should replace their furnace. Most often, homeowners wait until the last minute to have their furnace replaced. This is usually when they are facing a large repair bill or their furnace has stopped working completely. There are many factors to consider when deciding on the right time to replace your heating equipment. Furnace Efficiency – If you have a furnace that is 12 years or older it may be time to start considering the benefits of a new heater. Older furnaces require a lot more resources to run and technological innovations have made new furnace products exceptionally efficient. The cost of a new furnace can be offset by the energy savings. This is also something to consider if you are financing you new heating product since the monthly cost is reduced by savings on your utility bill. Repair Cost – Before you go ahead with a costly repair, take the time to consider how long your furnace should operate. There is a breaking point where you will be throwing away money with furnace repairs and instead should consider a new heater. We can help calculate this for you to show you the right time to move on to new equipment. Furnace Age – A broken down furnace almost always results in a higher cost than if you plan a new installation. By planning your furnace purchase ahead of time, you can take advantage of dealer promotions, government incentives, and avoid an emergency heating call. By being proactive with your furnace installation you are sure to save and not be inconvenienced by a broken down product. As an Ottawa Heating leader, we are proud of the reputation we have built. We maintain a 5 star rating on Google and Facebook, along with our A+ Rating with the Better Business Bureau. 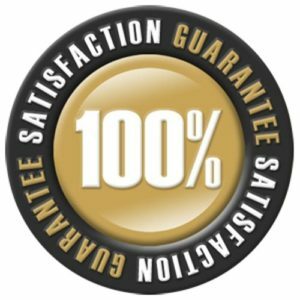 We have earned this reputation through high quality furnace installations by consistently delivering heaters that are both durable and long lasting. Our high efficiency furnace installations are done by expert installers that are directly employed by AirZone. When it comes to choosing a Ottawa Heating company, look no further than AirZone for a high quality furnace installation done right the first time. This is backed by our guaranteed quality along with a labour warranty directly from our company. Due to our high volume, we have some of the best prices in the city on quality furnaces and accessories! Most of our furnaces are ENERGY STAR® qualified, meaning they can significantly lower your utility bills when compared to conventional models. For optimal comfort and efficiency, a gas furnace can be combined with an electric heat pump in one dual-fuel system.